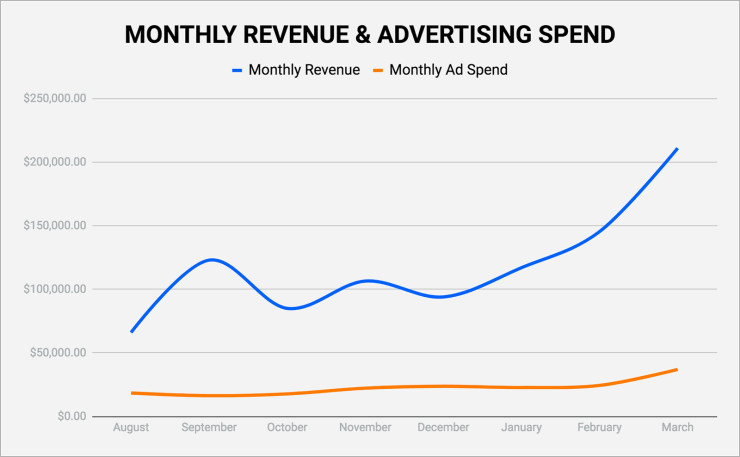 Facebook ad costs are rising. And for a lot of businesses, that means cost per acquisition is climbing too. 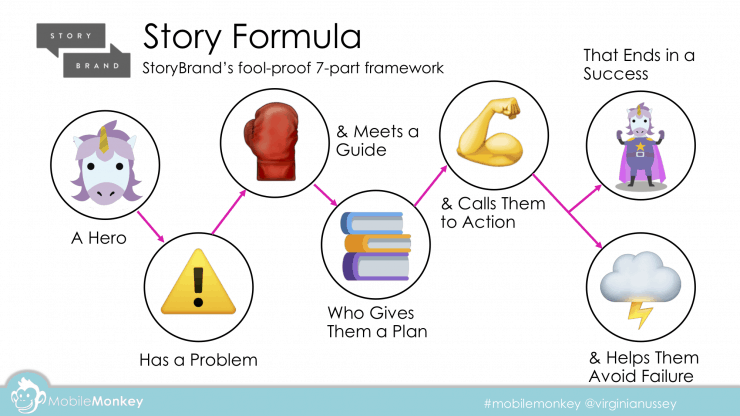 Virginia Nussey, MobileMonkey’s own Director of Marketing, took this challenge head-on in her recent ovation-worthy talk at the MobileMonkey Facebook Ads Virtual Summit. It’s worth your time and dollar to get the Summit replay. In case you can’t, Virginia and I sat down to distill her talk to a few hard-packed, tactical unicorn moves. 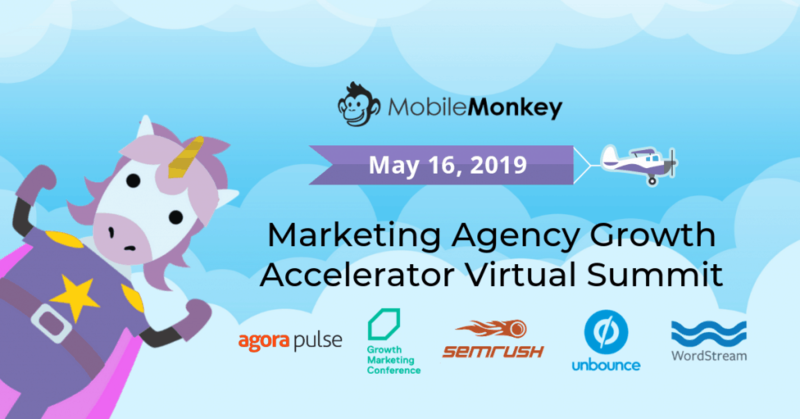 If this session was useful to you, grab your ticket to MobileMonkey’s next free virtual summit: Marketing Agency Growth Accelerator Summit on May 16! Learn more and get your free ticket here! Chat marketing solves the problem of Facebook advertising. 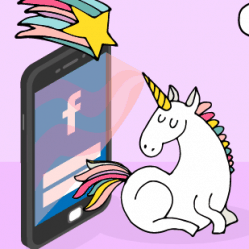 You know the hair-pulling problems with Facebook advertising already — the costs, the pain, the competition, the everything-that-you-cussed-about-during-your-last campaign. Heck, it looks like the News Feed is even dead! But the real problem? It’s the noise. This ad noise is everywhere, not just on Facebook. Apparently, the average Homo sapiens living in the modern age is exposed to 5,000 ads a day. Customers are going crazy simply trying to parse through all this noise, looking for the few signals that will help them to survive and thrive. Thankfully, there is a way to cut through the noise and reach the customer. Now, this isn’t one of those touchy-feely things where you have to sit cross-legged around some campfire. This is science. 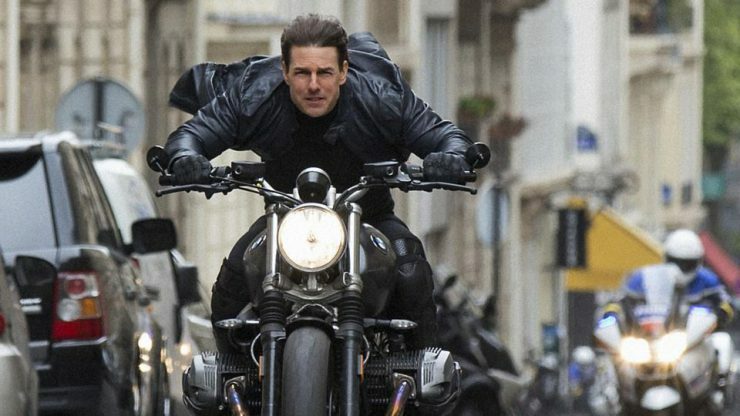 Once you see this formula, you can’t unsee it, its features, and its heroes — from Ethan Hunt to Katniss Everdeen. This story sequence is incredibly powerful. Among their unicorn-like magical qualities, stories are interactive. Stories erase customer assumptions. They foster goodwill. 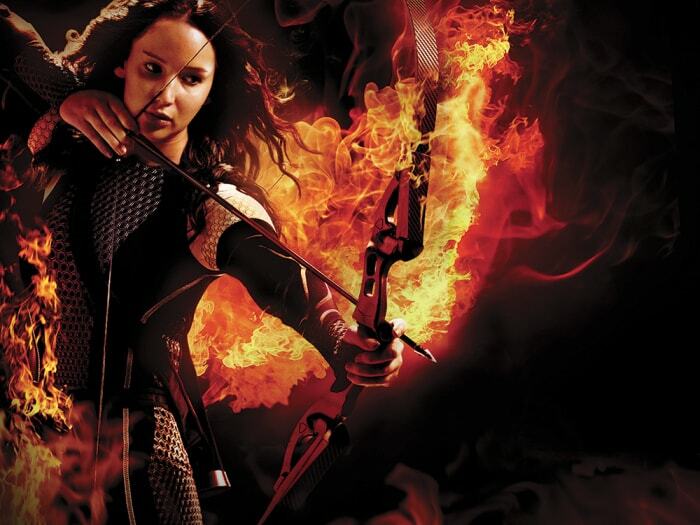 They engage with people emotionally and they put the hero in control. And for all of you Rhodes scholars who are one step ahead of me, yes, I’m going to tell you how this solves all the world’s problems — at least those that involve Facebook advertising’s feckless performance. In business, the best opportunity to tell a story is through a conversation. Landing pages? Sure,they’re great, but it’s really hard to get a story across through landing pages alone. One-on-one conversations effectively silence the head-splitting noise in customers’ heads. But are conversations possible in marketing? And if conversations are possible, are they scalable? The answer, in two words: chat marketing. Chat marketing is the tool that allows your brand to tell a story to each customer. I’m a fan of the kind of Facebook ads that give me targeted results, low CPR, and where I get my contact’s information. This is what happens when you use Facebook Messenger chatbots. These results came from a Messenger ad campaign we launched with MobileMonkey chatbots. 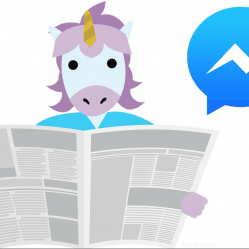 Your new Facebook advertising approach comes in the form of Messenger ads. They offer incredibly engaging ad formats that achieve 100% conversion rates, because you get everyone’s contact info! 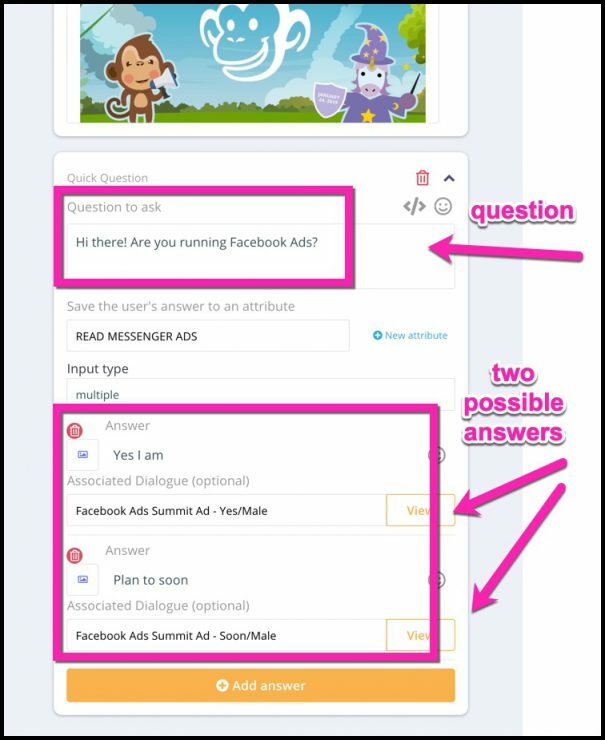 When you create these Messenger ads, you set up chatbot sequences that begin post-click. These chatbot sequences should include questions. Why questions? It’s easy. Questions get answers. Instead of bullhorn-style marketing — telling users what we think they want to hear — we can get information from the user to find out who they are, what they’re doing, and what they want. Besides, questions are inherently engaging. A question makes you think about the answer and then provide that answer. It’s easy for the user to answer the question with a simple tap. If they tap “plan to soon,” the sequence takes them down takes them through the beginner’s path. A story is developing. And another way of describing that story is funnel. See what’s happening? As the user answers questions and engages with the choose-your-own-adventure story, they end up with a CTA that they can’t resist. After all, they were the ones who segmented themselves into this position! This is just an overview of the process, but now I want to take you on a deep-dive into the exact, step-by-step way to make a chat ad that works for your business model. Make a messages ad campaign. If you’re running Facebook ads now or you’re familiar with Facebook Ads Manager, then you’ll recognize this initial screen here. The starting point is to select messages as the objective. Next, we’ll set up our adset. The Message Destination will be Click to Messenger. And then in your ad set, you set up your audience targeting. 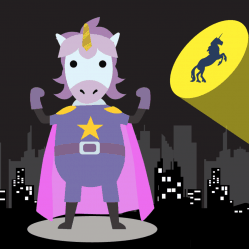 Here’s a super duper unicorn targeting tip. With remarketing, you’re sending your ad to somebody who already knows about your brand or engages with you on your website or your Facebook page or any number of things. 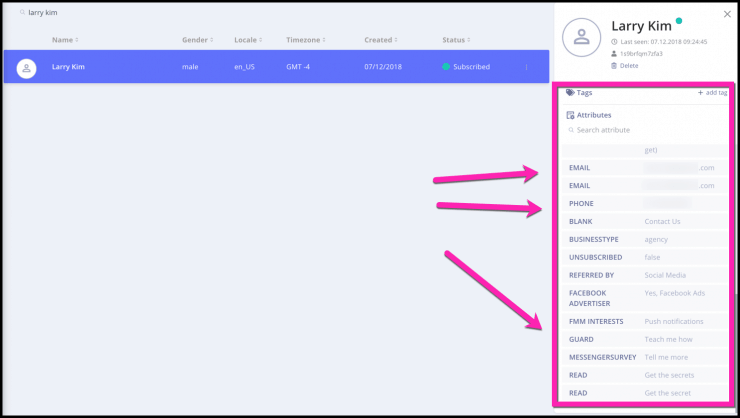 But you can set a custom audience based on people in MobileMonkey, any of the audience targeting capabilities that we’ll talk about in a little bit. So just file that in the back of your mind, where you can set up a custom audience and remarket to people who are in your MobileMonkey contacts as well. Note that some of the full spectrum of placements are not available in Messenger ads. However, we do have the Facebook news feed, the desktop or the mobile, Facebook marketplace, the Instagram feed and the Messenger inbox. When designing your copy and creative, keep in mind that you have one goal only: engagement. This point gets to the heart of Messenger ads. We’re changing up Facebook advertising from business as usual. We’re not angling for views or impressions. Your sole, number one, absolute, single goal is engagement. You want the customer to click or to tap. That’s it. How do you achieve the Holy Grail of engagement? Through curiosity. Curiosity is the number one factor that will get a click from the ad. And how do you create curiosity? By introducing a story, and leaving that story unfinished. Messenger ads are not meant to sell anything. You’re just starting a conversation. You get to start that conversation, and through the conversation they sell themselves. 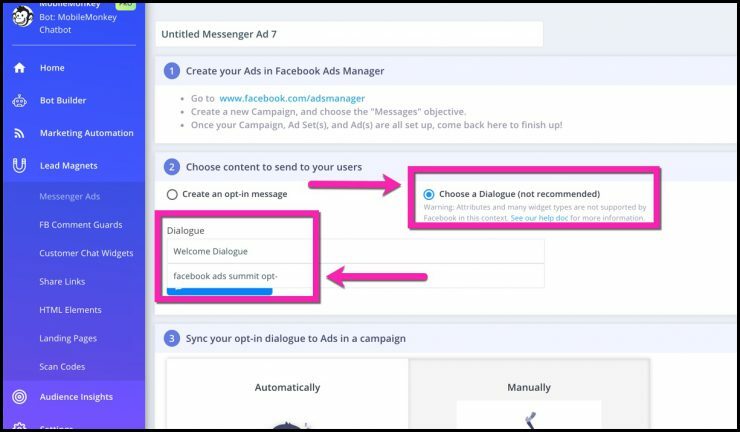 What happens after a contact engages with your Click to Messenger ad? They become a contact in your MobileMonkey database. You can go directly to your MobileMonkey account, click on Audience Insights → Contacts, and see everyone who is in your contact list. Facebook is giving you a ton of qualifying data just out of the box. You have a lead because you can check on their contact and you can see any forms they’ve completed and responses that they shared with you. Say it’s homeowners or parents or fitness enthusiasts, or car shoppers, whoever they are, whatever you’re looking for, you create a segment of audience. Then, you start a story, a conversation, that resonates with them. That conversation happens in a chatbot funnel. The chatbot funnel is where the engagement happens. In steps 1 and 2, we were just making initial contact, driving towards engagement. Once the engagement takes place, the magic of the story unfolds. 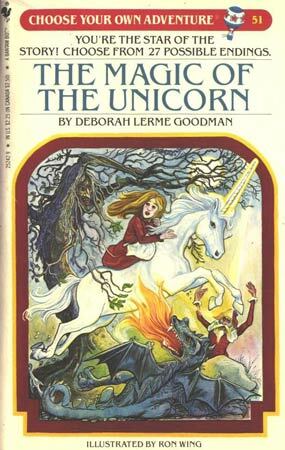 Did you ever read those Choose Your Own Adventure books? It’s this thing where you read a few pages, then you make a multiple-choice decision on what happens next in the story. It’s awesome. I like to use those books as an inspirational source when designing chatbot funnels. Basically, I want the user to feel like they’re choosing their own adventure. 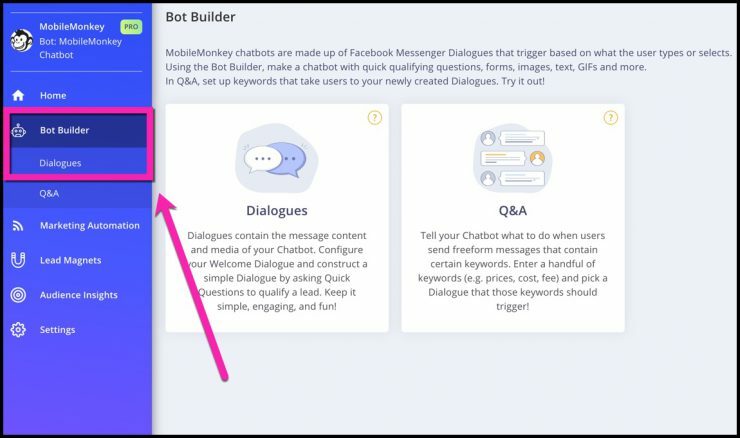 You create these chat funnels in MobileMonkey by going to the Bot Builder, and then dialogues. You’ll amass a big collection of chatbot dialogues over time, so it’s a good idea to keep them all neat and tidy in folders and directories. I have a folder for Facebook Messenger ads. Your conversation or chat funnel is going to use widgets. Widgets are any method of chat that you want to send to your user. It can be a text, image, gif, attachment, video, pretty much anything. One of my go-to widgets is the quick question. Remember how I mentioned that questions are critical to establishing that conversational element? Quick questions is the widget that lets you do that. To start off your sequence with a quick question, just tap quick question widget button and ask away. You’ll want to create low-friction questions and answers. Make it easy for the user to answer the questions, usually one or two choices, without having to think too hard. Depending on which of the options the user picks, you can assign the next dialogue for them to receive. You can create dialogues for every branch of your story, and simply add that as your associated dialogue depending on the answer the user gives. So, if they click “Yes I am,” then they’ll get the yes page. If they say “Plan to soon,” then they’ll get the soon page. Next, we’re going to create the code that we’re going to plug into Facebook Ads Manager. 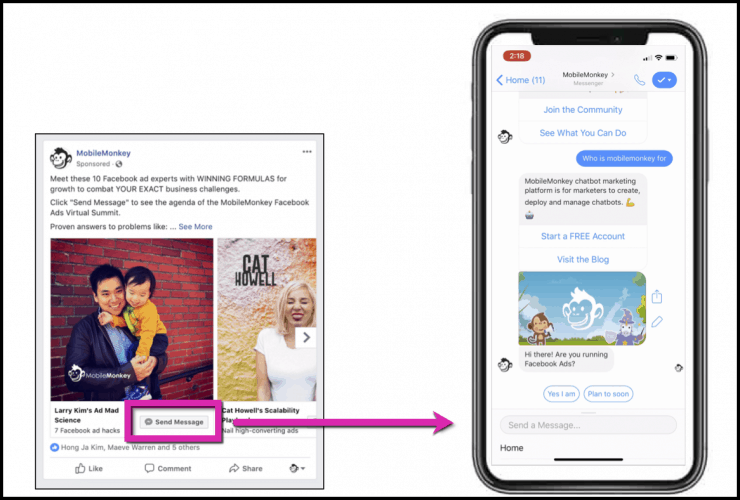 We’ll do this by using the Lead Magnets → Messenger Ads feature in MobileMonkey. 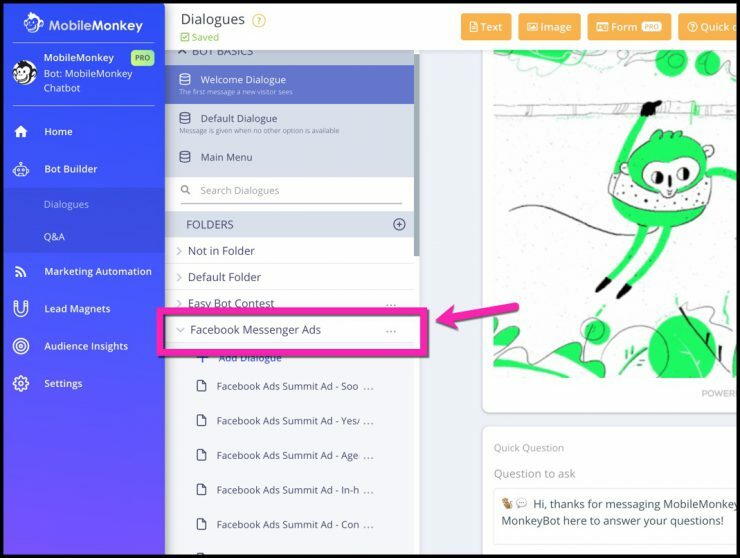 When you create this Messenger Ad, you’ll select the “Choose a Dialogue” option, then pick the dialogue you just created from the drop-down menu. Hot tip: You’re going to have a load of dialogues in this drop-down menu as time goes on. Rather than scrolling through it while reading War & Peace, just type in the name of the dialogue to laser-locate it. First, copy and paste the URL parameter into the Facebook ad. 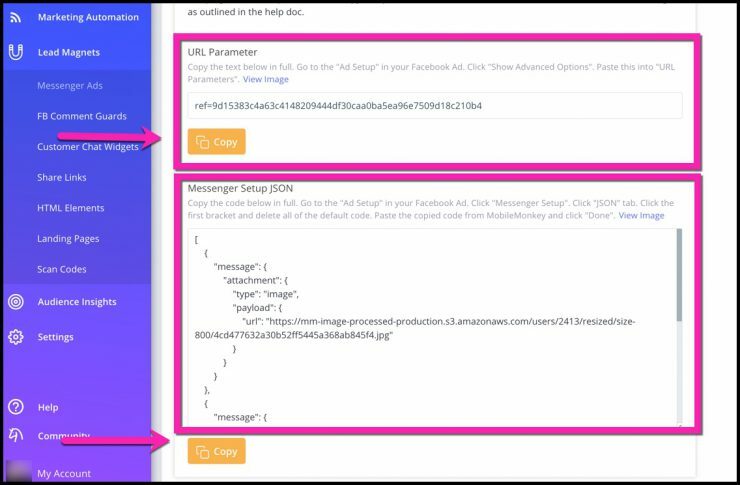 Second, copy and paste the Messenger Setup JSON into the Facebook ad. Launch your ad, and you are action. 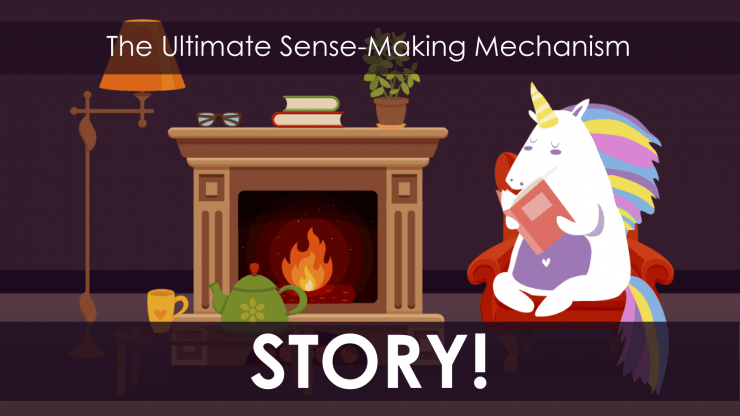 In the spirit of ethical pilfering, I’m going to show you the ultimate cache of stealable story formulas. These companies know what’s up when it comes to creating compelling conversations on Messenger, so I wanted to show each of them to you. 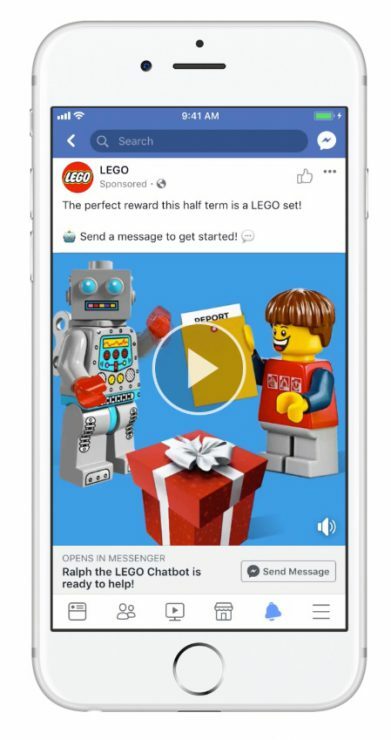 Lego nailed it with this Messenger bot that boosted their purchase value by 1.9X and improved their ROAS by 3.4X. Check it out in detail here. 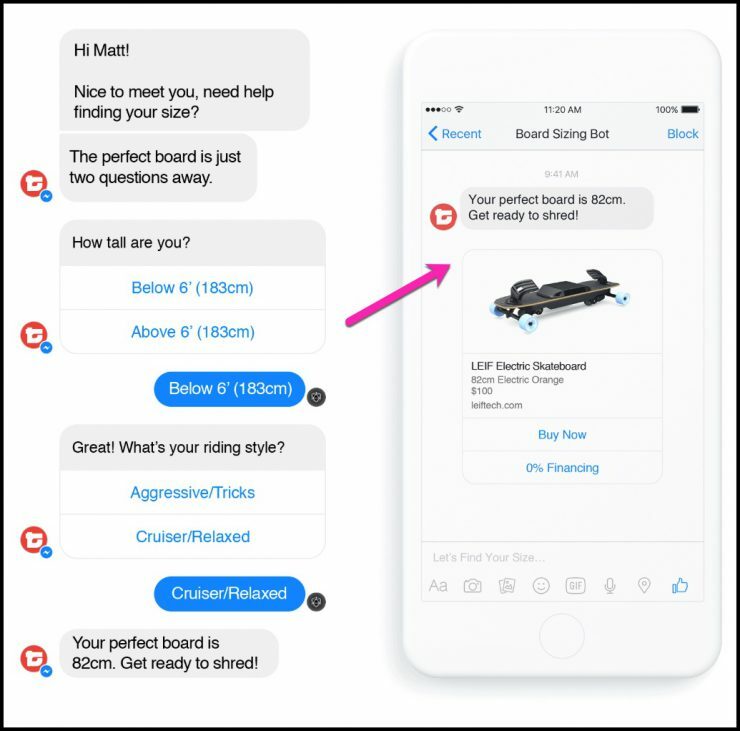 Another example of insane chat marketing results driven by Click to Messenger ads and chatbots came from Leiftech, an electric skateboard company. Get this. They boosted their revenue by 329% by using Messenger ads and chat marketing. That’s revenue! And they didn’t have to spend proportionately more on advertising to achieve those results. ROAS soared by 5.4x, and sales increased by 320%. Their concept was simple. The Messenger Ad walked users through a sizing guide to pick the perfect electric skateboard. Fanta, the drink, did something equally remarkable. Their goal was to get people to try a new drink, so they used Click to Messenger ads to achieve this goal. If numbers like 2.6 million scare you, don’t worry. Messenger bots are designed for scale. How’d they do it? You can read the whole story here, but it essentially involved targeting the right audience with their ad, opening a conversation with a coupon offer, and providing timed reminders to the user if they hadn’t redeemed them within a certain amount of time. It took the marketers just five hours to create the chatbot prototype, so if you’re pressed for time, don’t sweat it. Equally brilliant is Sephora’s chatbot for Messenger, the Sephora Assistant. 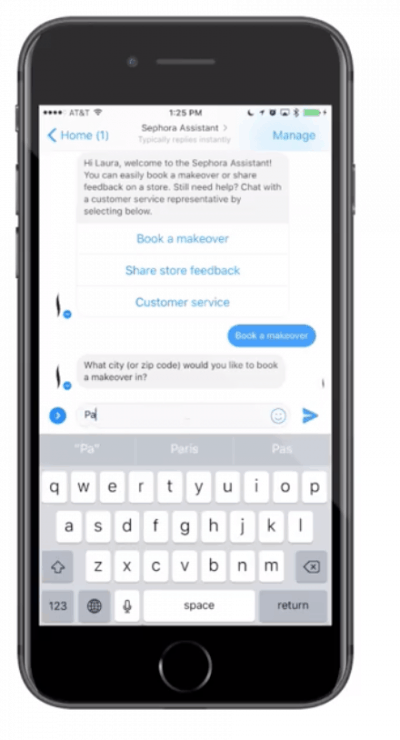 When the global prestige beauty retailer released their chatbot, they scored higher booking rates (11%) and shortened the steps required to book a real-life makeover. MobileMonkey has a whole library of chatbots that you can clone. All you have to do is open up up MobileMonkey and edit these templates. Today’s marketer needs more than a knowledge of Facebook advertising and the tooth-gritting determination to make it through another bad day. Today’s marketer needs chatbots. Look, this is only the tip of the iceberg. There is so much more to chat marketing! Click to Messenger ads just get you in the front door. Winning at Facebook ads starts here. Respectfully place your well-loved Facebook advertising hacks aside for the time being. 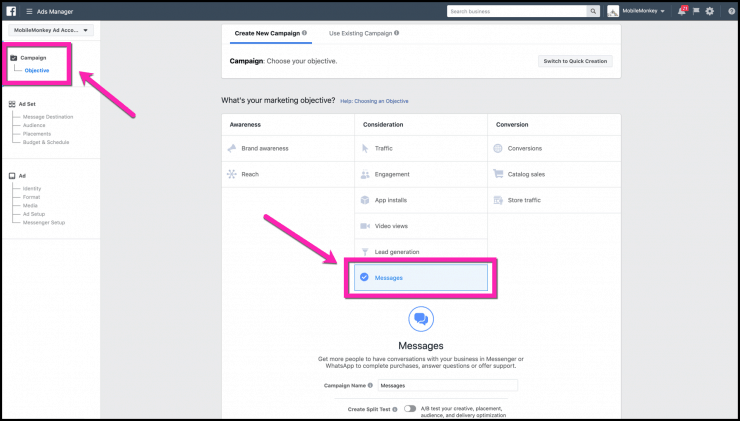 Create an engagement-focused ad using Click to Messenger. Develop a chatbot that starts a conversation. Let the user choose their own adventure (to conversion) through the chatbot conversation. They win. You win. We all win. MobileMonkey has teamed up with our proud partners Agorapulse, Growth Marketing Conference, SEMrush, Unbounce and WordStream to bring you a one-day spectacular exclusively focused on the most effective ways to scale a marketing agency. Learn the secrets to landing huge clients, contracting higher retainer fees, pricing, packaging and bonus models, and extending the lifetime value of agency clients at the Marketing Agency Growth Accelerator Summit. Get your free ticket today! 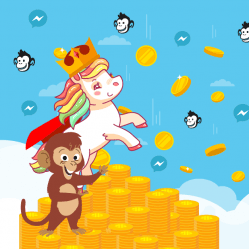 Join MobileMonkey Island and ask questions and get answers alongside 18,000 other chatbot marketers in the Facebook community.